Fritomania cooks their fries in peanut oil which gives them a different taste. 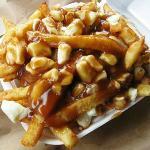 The poutine is fantastic and the service is exceptional. My only regret is that they are closed from mid December until mid March. Our family consists of poutine connoisseurs! We have had poutine Crome different places and done blind taste tests on two occasions. Fritomania always comes out on top. They are generous with the curds (will layer them in with the fries if you ask) and their poutine is Oh So delicious! I can not vouch for anything else other than their poutine, as that is all I ever order! Yum!! One of the best chip stands. Their pogo and hot dog are great. The poutine is one of the best that I ever had, the grave is what makes the poutine. I've had the poutine from the cheese factory in St Albert, it was terrible. My wife, son, and grand daughter did not like the grave. The owners are so friendly, the fries are hand cut and I crave the poutine weekly. Sadly they will be closing for the winter soon and I will be without until spring. Today I want d chip wagon fries and a hot dog while I was in Orleans and this chip wagon had been here a very long time and it was great when I lived around here. But as always things do change, the hotdog was just average but presented well in a small cardboard holder on top of the standard paper one... but the fries were soft and mushy and not close to the crispy fries one normally gets at a chip wagon and I did not even put vinegar on it. I was very disappointed in my visit even more so we that I am on a diet and was willing to cheat a bit for chip wagon fries. They need to watch out as this encourages competition and they would lose out. I won’t be back here! Been to Fritomania? Share your experiences!